The Creators Update brings Paint 3D app to Windows 10. Paint 3D replaces the classic Paint program that we all use and love. The Paint 3D offers several new features that you can’t find in the classic Paint program. The Paint 3D app is part of Windows 10 in Creators Update and above versions. Since it’s a new app, at times, you might find issues while attempting to launch or use it. For instance, it might refuse to open when you try to launch the app. While Paint 3D is an excellent piece of software, many users who use third-party apps might want to uninstall it from Windows 10. Luckily, Windows 10 now offers easy ways to completely uninstall and reinstall default apps including Paint 3D. If for any reason, you want to uninstall Paint 3D from your Windows 10 PC or need to reinstall Paint 3D to address an issue with the app, you can do so by following given below methods. Step 1: Open Settings app. Click System icon, and then click Apps & features. Step 2: Look for the entry named Paint 3D, and then click on the same to see Uninstall button. Step 3: Click the Uninstall button and then click Uninstall button again when you see the confirmation dialog to completely remove Paint 3D from your Windows 10 installation. That’s it! You have successfully removed Paint 3D from. 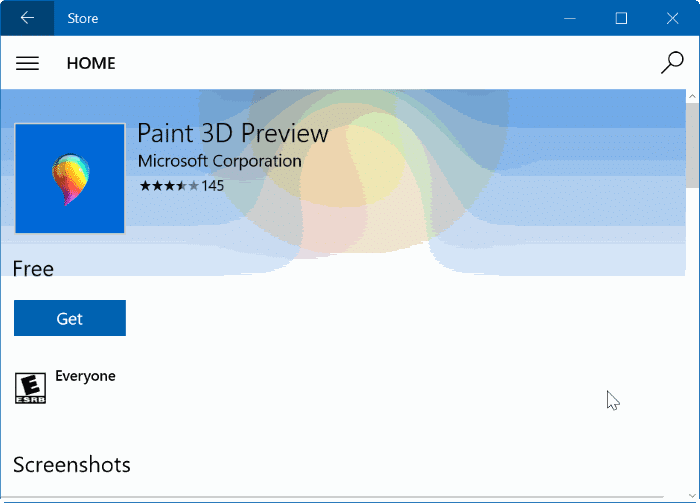 If you don’t want to reinstall the Paint 3D app, you don’t have to follow next two steps which are about downloading and installing Paint 3D from Store. 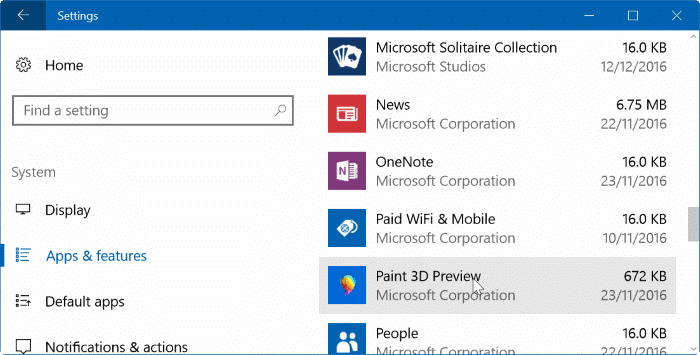 Step 4: Visit Paint 3D page of Store in your web browser to automatically open the page in built-in Store app. Step 5: Click Get button to download and install Paint 3D app. Note that you can install apps from Store without signing in to Store with a Microsoft account. 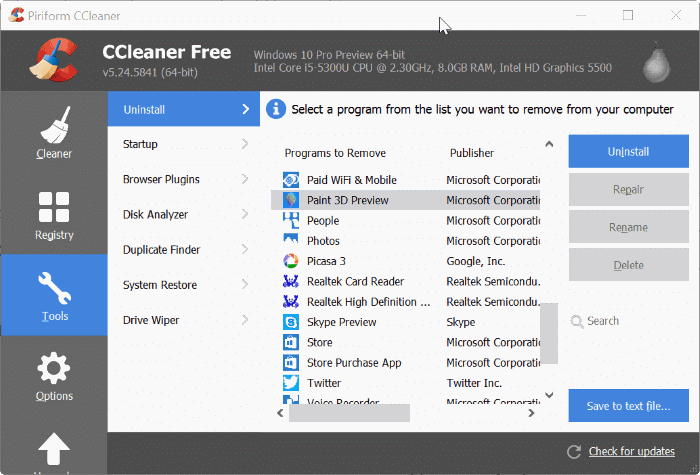 Step 1: Download, install and Run CCleaner (free) for Windows 10 program. 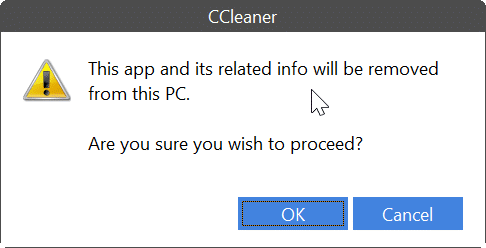 Step 2: Launch CCleaner. Click Tools. Click Uninstall to see all installed classic desktop programs as well as modern apps. Step 3: Locate Paint 3D entry, right-click on it and click Uninstall option. Click OK button when you see the confirmation dialog to uninstall Paint 3D. 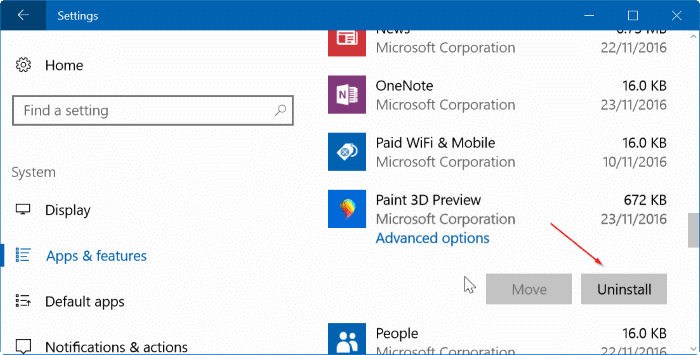 Step 4: Visit Paint 3D page in a web browser to automatically open the page in Store app and then click Get button to download and install the app. That’s all! 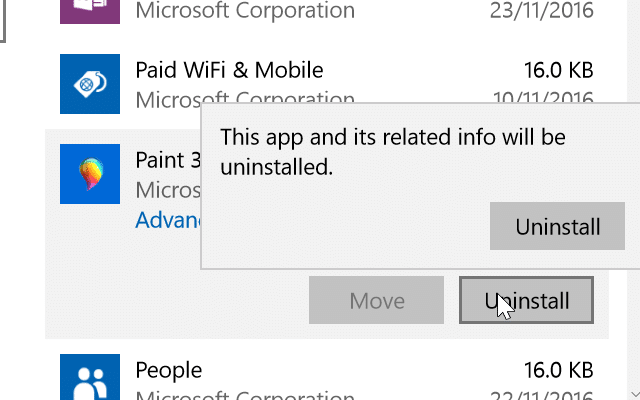 Tip: You can also use the PowerShell to uninstall any app in Windows 10. Please refer to our how to reinstall Store and other preinstalled apps in Windows 10 guide for detailed instructions. Just use Ccleaner, seems to work correctly. I am having the same problem of only seeing Paint 3D, which I do not want, but the uninstall button is grayed out. Now whenever I open a photo on my computer, it opens in Paid 3D. I need to get rid of it permanently and just use Paint which I have. It does not show Paint 3D Preview, only Paint 3D. It does not allow me to uninstall. Paint 3D is terrible! I want the old paint program back, how do I get it back? The Uninstall Button is grayed out for me.